Intel has refreshed its top of the range Xeon processors with the new Xeon E7 v3 models, based on the Haswell microarchitecture, a product line that will target analytics, business intelligence, ERP, OLTP and so-called big iron tasks. The new family comprises of 12 SKUs with up to 18 cores and 45MB of L2 cache on the biggest (and most expensive) model, the E7-8890, which is clocked at 2.5GHz. Intel is still using a 22nm process, which explains why that particular chip has a rather toasty TDP of 165W (in all fairness, some of the increase might be due to the integration of the voltage regulator). The next iteration of that chip, codenamed Broadwell-EX, will be etched using a 14nm process, which is likely to cut power consumption. Other notable features include DDR4 support, up to 1.5TB of RAM in 8-socket mode, up to 32-socket per configuration and the ability to mix and match different SKUs in the same system. The new platform is expected to deliver up to 10x performance improvement per dollar compared to the (mostly RISC-based) competition, at about one-eighth of the total cost of ownership spread over four years. 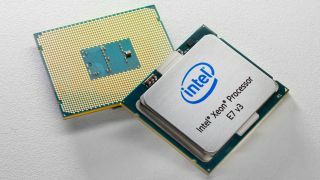 Even compared to the previous Ivy Bridge-based models, Intel claims up to 600% improvements on some enteprise applications although that is down mostly to software optimisation.